Reducing your environmental footprint during the cleaning process is exactly what we had in mind when developing KAPTURE. This environmentally friendly recycling system separates soils from the solvent during the degreasing cleaning process. 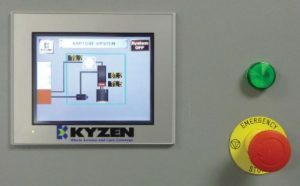 By continuously removing contaminants during normal operation, this system enhances the overall solvent quality and keeps production interruptions to a minimum. For a list of KYZEN’s recyclable solvents, please visit VaporDegreasing 20|20.